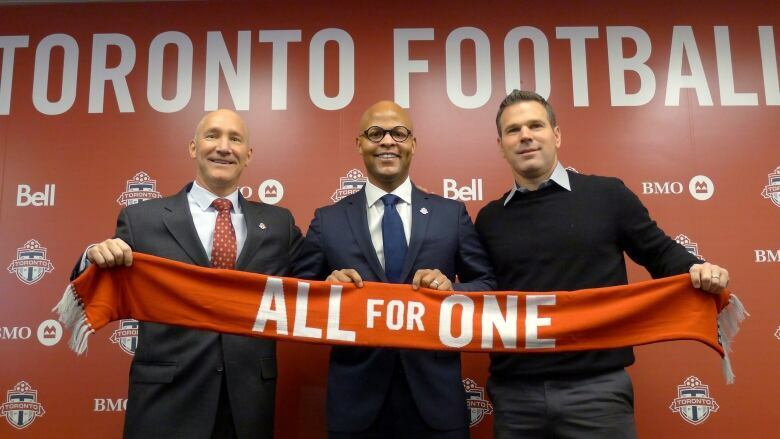 Toronto FC named Ali Curtis its new general manager Thursday, succeeding Tim Bezbatchenko. The 40-year-old Curtis most recently served as sporting director for the New York Red Bulls. He left the New York-area team in June 2017. In naming Ali Curtis its Toronto FC's fifth general manager, Toronto FC is getting an MLS veteran who always has a plan. He famously arrived as sporting director of the New York Red Bulls with a binder full of blueprints for the team. Now the 40-year-old is being asked to return TFC to a championship-calibre team. Curtis left the Red Bulls in early 2017, in a somewhat messy breakup after helping build both the first team and a flourishing talent pipeline. Without going into details on his departure, he said it had been time to turn the page and that he took a step back to get some perspective on what he wanted in the future. "This opportunity came along and it's the right fit. It's the right club, it's the right people," Curtis said at his introductory news conference at Toronto's training centre. "Today has been a long time coming but I'm very, very excited. So I can't wait to get to work." In succeeding the cerebral Tim Bezbatchenko, the competitive Curtis will bring his own style to the job. "There's an intensity to the way I work and the level of execution that I demand out of myself and everyone around me," Curtis said. As befitting a man whose full name is Ali Muhammad Curtis. The job came open when Bezbatchenko left to run Columbus Crew SC. That job has yet to be officially announced but sources say Bezbatchenko is headed back to his hometown to run both the sports and business side of the club. Manning said Bezbatchenko had been given permission before Christmas "to seek another opportunity." The day after Christmas, the two spoke again and Manning summoned head coach Greg Vanney to talk about successors. "Ali was at the top of both of our lists," Manning said. Toronto got some financial compensation from Columbus in allowing the under-contract Bezbatchenko to leave, Manning said without elaborating. Vanney spent a day with Curtis in Phoenix last week. The meeting went well and the team offered Curtis the job on Monday. "Greg and I knew right away that while we certainly will miss Tim, we wanted to get the best guy out there to lead this franchise, in terms of soccer, going forward ... We wanted to make sure we didn't miss a beat as we go into 2019," said Manning. Bezbatchenko joined Toronto in September 2013, helping build a team that went to the MLS Cup final twice — winning in 2017. While he was not made available Thursday, Bezbatchenko will be in Toronto the next few days to help Curtis with the transition. "He leaves this franchise much better than when he started," Manning said. Curtis inherits a team that went from MLS champion in 2017 to 19th place during an injury-ravaged 2018 season. The club has 25 players under contract, including newcomers Nick DeLeon and Laurent Ciman, but is looking for depth on attack and in goal. "He's not coming into a bare cupboard," said Manning. Still, Curtis will have to hit the ground running. The MLS Combine started Thursday in Orlando with the draft set for Jan. 11 in Chicago. Toronto picks sixth overall. Players report to camp Jan. 14 with CONCACAF Champions League round-of-16 play kicking off Feb. 16 in Panama against Club Atletico Independiente. Toronto opens MLS play March 2 in Philadelphia. The future of designated players Michael Bradley, Sebastian Giovinco and Jozy Altidore also has to be addressed as they enter the last year of contracts that totalled more than US$18.5 million last year. Curtis said while he will listen and learn to start, he also plans to roll up his sleeves and get his hands dirty. "I'm not worried about the tight deadline," he added. "I think sometimes those are challenges but they're also opportunities." Quoting tennis trailblazer Arthur Ashe, Curtis said: "Start where you are. Use what you have. Do what you can." Curtis will be around familiar faces. Manning, then an executive with the now-defunct Tampa Bay Mutiny, drafted Curtis second overall in the 2001 MLS SuperDraft. Coincidentally Ryan Nelsen, the former New Zealand international Bezbatchenko fired as TFC manager in 2014, went two picks later to D.C. United in that draft. Curtis got to know Vanney over the years. And he worked alongside Bezbatchenko in their time at the league office, counting him as a friend ("I may have interviewed him," Curtis said). "We've rooted for each other, wherever we are," he added. As a player, Curtis was twice honoured as the top NCAA men's college player, scoring 53 career goals for Duke. He spent four seasons in MLS, collecting nine goals and eight assists in 65 games with Tampa Bay, D.C. United and Dallas. He worked several years for investment banker J.P. Morgan before being poached by MLS commissioner Don Garber to work in the league office. He spent eight years there, holding the position of senior director of player relations and competition when he left to join the Red Bulls in 2014. "I knew at some point we'd be working together. It was just a matter of when," said Manning.